I've talked about my shopping trip to Cleveland several times, but haven't taken the time to fully explain the significance of this trip or even why a group of women would choose Cleveland, Ohio as their Christmas shopping destination. The trip started 22 years ago with my Mom and her three sisters accompanying my NaNa to a suburb of Cleveland where my Aunt Susie lives. 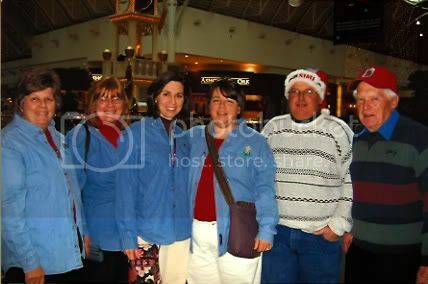 The purpose of the trip was to help NaNa do her Christmas shopping -- at least that's what everyone told their husbands. Since then, the trip has happened every year in the first week or two after Thanksgiving. Anyone over the age of 18 is invited to tag along, as is anyone who is not yet walking. I think I made my first trip when I was about 22. I remember expecting that we'd have a nice leisurely lunch, stroll through the mall and turn in around 9ish. Boy, did I underestimate these women. We generally pull into Cleveland around 1 or 2pm and head to the mall for lunch. Over lunch in the food court, the lists come out. Some lists are computer-generated, others are scratched onto lined notebook paper. Some are color-coded, others are divided by stores at which the purchase should be made. But be assured, everyone at that table has their lists. This is also the time that the coupons come out -- Bath & Body Works $10 off, JCPenney save an extra 15%. Just in case the other shoppers can't detect the seriousness of the mission, our group has chosen to identify itself with matching shirts, a relatively new phenomenon in this event's history. This year's shirts -- recycled from last year -- aren't too bad. Denim with a reindeer embroidered in the "Izod" spot and a reindeer pyramid on the back. In years past, the annual shopping shirts definitely would have made the What Not to Wear "worst of" show. The first year was sweatshirts of the iron-on-outline-with-fabric-paint-variety. Purple sweatshirts with bright Christmas lights on them. Then there was the glowing turqouise sweatshirt with ironed on snowmen pictures. I think the worst was the ivory sweatshirt cardigan with a snow Statue of Liberty bearing the phrase "Life, liberty and the pursuit of the perfect gift." The shirts help us find each other in a sea of shoppers and keeps other people wondering if we're going to stop at the Santa village and break into carols. Be thankful we do not. the year that my mom peed her pants laughing so hard...wait! That's every year. Except the advent of discreet incontinence protection has robbed the rest of us of the chance to tease her about it. the year that Aunt Connie bought so much stuff -- including 8 pairs of boots and 6 giant bags of clearance rack clothing, that there wasn't room for NaNa's wheelchair in the car. Once we close down the mall at 10pm (open late after Thanksgiving), we head to Kohl's to scoop up the deals there. Then it's back to Aunt Susie's house for dinner -- at 11pm. No need to ask what's on the menu: lasagna, salad, bread and butter. The meal is as traditional as turkey on Thanksgiving. We all fall alseep fast and hard. In the morning, we sit down to the annual egg casserole and bagel breakfast and map out the morning's shopping. Though there's not much mapping to be done -- we go to the same stores every year. Target, then the Champ's outlet, Old Navy, and if Aunt Connie is with us, T.J. Maxx. Back home for the traditional lunch -- sloppy joes, potato chips and pecan sandies cookies -- and then the traditional jamming of all the purchases into the cars already full with people, pillows and overnight bags. For all of the traditions, things have changed over the years. The biggest change is that NaNa is no longer with us. She passed away in August 2007. So PaPa comes instead. And since he broke the estrogen barrier, my uncle Bill has started coming too. (Mom, Aunt Susie, my sister Shelley, me, Uncle Bill, PaPa. I know that Christmas isn't about the shopping and the presents. But it is about love and family and amidst all the strategizing and bargain hunting, that's precisely what our annual shopping trip is about too. Oh, Amy! I love love love this! I cried a little - in a good way. I will make sure mom reads this. It will perk up a little. This will be a good to flag for your book. Wow you guys are organized. You put me to shame. Amy- when describing our "what not to wear" shirts, you left out some of the "why's" behind our choices. The purple shirts were our first and although maybe a little gaudy, they were very effective. You don't see many Plum Purple groups in the mall around Christmas, and besides, Purple is Aunt Susie's favorite color. The peacock blue shirts were chosen after 2 yrs of purple because of their distinctive color and the fact that they matched the details in the snowman pictures. The off white cardigans with the Statue of Liberty Snowmen were NOT the worst. They were very comfortable, and if you recall, YOU came up with "Life, Liberty and the Pursuit of the Perfect Gift" line! Besides, they were perfect because they all tied into Nana's 4th of July birthday! 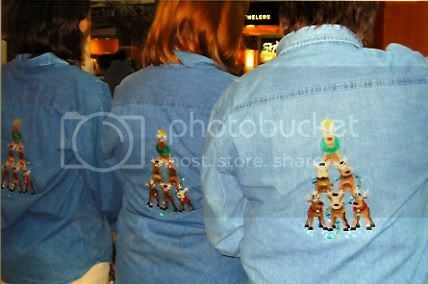 Now the denim shirts are pretty good, too, but it's not as easy to find each other in the stores. Since this is the 3rd year for them, it's about time to come up with a new design/color for next year. And we need to be sure that Papa and Billy get one, and Howie,too! I was bummed I couldn't make it - but reading this made me REALLY sad I didn't make it. You're right it is something special! My favorite trick is to take the "free with any purchase" coupon into Bath & Body Works, and then buy the thing in the store I can find for $1.00. There might be only one or two items in the whole store that retail for $1.00, but by golly, I find it! Sounds so fun. I love when I get together with my crazy aunts and cousins and laugh until we pee. Someday, you and I will be wearing those "discreet incontinence" products, too.